Other than the stupid phrase “sleep like a baby” (I mean really! Aren’t babies famous for NOT sleeping?) this is a useful article on better sleep for pregnant moms. Great resource for finding videos to show to children to prepare them to be present at the birth of a sibling. Organized by type and with detailed disclaimers on what you see and hear. One recent trend I love is having partners be involved in catching their baby. The emotion of that once in a lifetime experience can not be beat. Here are some tips on how you can make that experience happen for you. 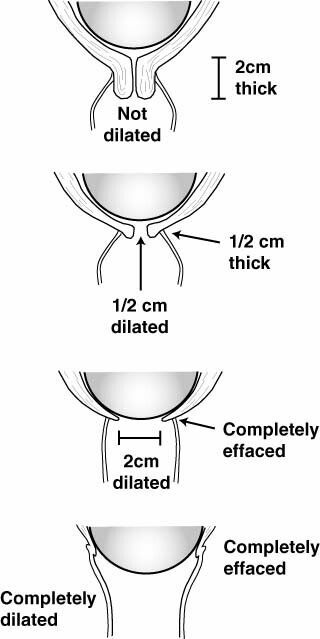 Nice image that clearly shows dilation and effacement. 3 Things you can’t learn about labor online or in a book. Vaginal exams during pregnancy are a necessary rite of passage in the third trimester, right? Think again! Today’s video is a blues song “Married to a Midwife”. I bet my husband could relate, even though I am not a midwife!